In collaboration with C.B. Hannegan’s and Strike Brewing, the 4th Annual SF Beer Week Beer Run heads to the South Bay. Join us to celebrate the unlikely union of beer and running in this unique SF Beer Week event to benefit Autism Speaks and 2nd Harvest Food Bank. Where: C.B. Hannegan’s at 208 Bachman Avenue in downtown Los Gatos. What’s the course? : We’ll start at C.B. Hannegan’s, head to the Los Gatos Trail, then turn north, run the trail to Vasona Park to the Vasona Park Dam and then turn around and go back to C.B. Hannegan’s. That’s 5 miles total, but if you want to run a little less (or more!) that’s OK. In the spirit of the beer run, finishing times or places will not be kept. No entry fee either! About the run: It’s a run, not a race! Please obey traffic signs, yield right of way to vehicles and peacefully co-exist with other runners, bikers and walkers on the course. We may employ a wave start if necessary for crowd control. What happens afterward: Stick around and enjoy a Strike Beer and food at C.B. Hannegan’s and meet Strike Brewmaster Drew Erlich. They’ll be a post-run raffle to support Autism Speaks and, in memory of the late beer writer Bill Brand, 2nd Harvest Food Bank. Raffle prizes: Both Runner’s Factory of Los Gatos and Running Revolution of Campbell have pledged a $25 gift certificate for the raffle. In addition, the Runner’s Factory will give all runners who mention the beer run a 20% discount on any purchase. In addition, both Adventure Sports Journal and Strike Brewing are providing T-shirts and other items for the raffle. Tell your friends…the Beer Run Facebook page can be found here. 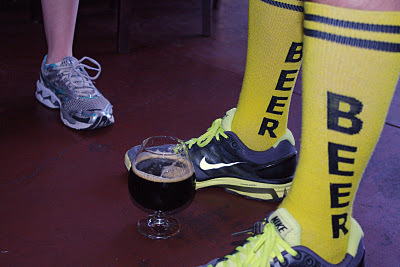 Not so unlikely a union – Check out the Hash House Harriers, we're drinking and running every week through your hood!